“Darling I love you, but give me Park Avenue” was one of the lines in the theme song of the popular late ‘60s TV show, Green Acres. Park Avenue is well known as the street where Manhattan’s rich and famous live. While Calgary doesn’t yet have an uber-luxury street like Park Avenue - or for that matter even a luxury condo neighbourhood like Chicago’s Gold Coast - it soon may have one. New York City's Park Avenue. 26th Avenue in Mission is home to several luxury condo buildings. Over the past few decades, the three-block stretch of 26th Avenue east of 4th Street SW in Mission has gradually become home for many of Calgary’s rich and famous. One of Calgary’s first luxury condos was Roxboro House built in 1977. Though there was not a lot of condo construction in the ‘80s and ’90, early in the 21st century (in 2000 to be exact), saw the opening of 56 luxury homes in the 16-storey The Grandview on the east side of 2nd street on 26th Ave SW. Since then, Calgary’s condo culture has evolved significantly, with more and more baby boomers becoming empty nesters and wanting the all the comforts and freedom condo living offers up. Mission has become the preferred place for many of those who live in the mansions of Roxboro, Elbow Park and Mount Royal to retire. Seizing the moment, 26th Avenue River Investments Inc. working with DIALOG architects, conceived The River, a 15-storey condo building with townhomes along the street. The resulting 38 homes are huge from 3,000 to 5,000+ square feet; this is a vertical mansion. The River became notorious in 2012 with its record-breaking sale of a penthouse (5,626 sf with 2,950 sf of outdoor space) for almost $9.5 million. It also broke with 26th Avenue tradition with its more contemporary glass and sandstone-coloured façade and an interlocking rectangular design that sets it apart from the brick facades of the older condos. The River’s townhomes form a long linear cube-like streetscape with two hard edge rectangles, one being glass and the other, stone, which forms the tower above. The design is very contemporary in a conservative and timeless way. What also sets The River apart from the older condos is that it is on the south side of 26th Avenue backing right onto the Elbow River. Complete with a self-serve wash bay where you wash Lassie’s muddy paws after a walk in the park or along the river. The River is expected to be move-in ready by mid 2015. The proposed new XII condo is both futuristic and chic. The new kid on 26th Avenue is The XII, designed by Calgary’s own Sturgess Architecture. There is nothing conservative about this condo with its fully automated parking system (drop your car off at ground level and it parks itself) and its Pac-Man/Transformer-like design. There is a two-storey white façade base at street level, with the white façade continuing up the back of the building to a stark protruding white two-floor penthouse condo that mimics the base. Inserted inside the white mouth-like vertical element is an 11-floor dark grey/black façade tower with large white protruding balconies. There is a peculiar dissonance in the juxtaposition of the dark and white elements. The XII is like nothing seen in Calgary before and will definitely add to Calgary’s growing reputation as North America’s newest design city. The River offer a more traditional design on the banks of the Elbow River. Like Mission’s 26th Avenue, Riverfront Avenue in Eau Claire is also vying to be the “Park Avenue” of Calgary. The all-brick Eau Claire Estates (built in 1981)was designed by world-renowned highrise architectural firms Skidmore, Ownings and Merill (founded in 1936, it is one of the largest and most influential design firms in the world, one of their signature buildings the worlds’ tallest building, the Burji in Dubai). Eau Claire Estates’ design, well ahead of its time has 10 connected towers (the tallest being 25 floors), with no more than two homes per floor and all situated around a beautifully landscaped central courtyard. With 14 elevators, there is no waiting to get home and enjoy the sun setting over the downtown skyline and majestic Rocky Mountains for its residents. The Princeton offers luxury urban living on the Bow River but just minutes from Stephen Avenue Walk and the Olympic Plaza Cultural District. Eau Claire Estates sat alone on the Bow River until the ‘90s when Prince’s Island Estates and the Princeton joined it along with the Eau Claire Y and Eau Claire Market. In the past few years, development along Riverfront Avenue has increased dramatically with Vancouver’s Anthem Properties’ Waterfront project on the old Greyhound Bus Barns site east of Eau Claire Market. With 1,000 condos in three highrise towers, as well the low-rise condo/townhomes along the pathway, this is Calgary’s largest condo project to date. However, the big new luxury condo news for Riverfront Avenue (technically it is on 1st Avenue) was made in June of 2014 when Vancouver’s Concord Pacific Inc. announced they had engaged prominent Canadian architects Arthur Erickson and Peter Busby (both of Vancouver) to design 185 luxury suites just west of the Princeton, across from the Peace Bridge. Though The Concord’s list of amenities is huge, the one that caught my attention was the golf simulator (though I expect the four seasons park, which will include a pond for skating in the winter, will attract most people). The two-building design, with each tower cascading down in height from 1st Avenue to the river, has the two towers facing away from each other in a V-shape to create maximum privacy. The design and juxtaposition will also create large patios and spectacular views of the river valley and the private park. In many ways, it is a modern version of the ‘80s Eau Claire Estates. The 2007 Princeton meets the early '80s Eau Claire Estates. Park Avenue’s name is derived from the fact that it offers spectacular views of the iconic New York City’s Central Park. Calgary’s Central Park (aka Memorial Park) located in the Beltline between 2nd and 4th ST SW and 12 and 13th Ave SW pales in comparison, but it is too surrounded by intriguing upscale new residential towers. 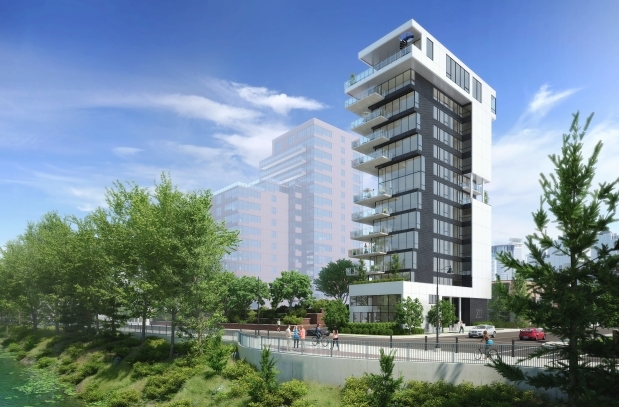 The Park at the corner of 13th Avenue and 2nd street is glass tower that cascades downward from south to north, giving the top floor penthouses spectacular views of both Central Park and Haultain Park, as well as Calgary’s dynamic downtown skyline and huge patios. The newest kid on the park is Qualex-Landmark’s Park Point (corner of 12 Ave and 2nd St. SW) designed by Tony Wai and his team at IBI in Vancouver. It has a very striking black and white façade design that segments the 34-story tower into five, black grid-blocks (the largest box is at the top, making the tower look top heavy) that look like an upside-down sound bar from an old stereo receiver or rock concert soundboard. The façade design is also reminiscent of the sculptural, wedding cake highrise towers popular in Chicago and New York City in the early 20th century, except it is upside down. I expect it will become the Beltline’s signature building. While Calgary cannot match New York or Chicago for luxury, highrise, urban condo living today, it is certainly making great strides to get there. YYC walkabout: Mission et al!